Willard (left) and Wilbur (right) Diefenthaler. Born twenty minutes apart in Kiel, Wisconsin, identical twins Willard and Wilbur Diefenthaler share a story of duty and sacrifice during World War II. They were drafted together on December 7, 1942 and after induction at Fort Sheridan, Wilbur joined the 919th Field Artillery and Willard went to the 101st Airborne Division. After three months, Willard requested a transfer and joined his brother at Camp Phillips in Kansas. 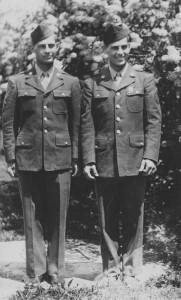 The brothers later joined the 106th Infantry Division, where Wilbur became an assistant supply sergeant and Willard worked with chemical warfare. After training in Indiana, the 106th was sent overseas in October 1944 and experienced its first major conflict in December 1944 at the Battle of the Bulge. On December 19, 1944, German soldiers captured Willard and Wilbur along with 1200 of their comrades. Knowing his captors would take any valuables, Willard threw his wristwatch to the ground and stomped it into the mud and snow, effectively hiding it until the inspection was over. 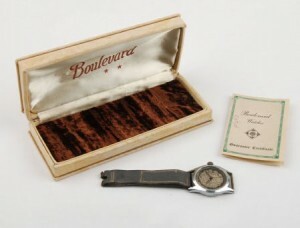 This watch is now in the collection of the Wisconsin Veterans Museum, its glass still cracked from Willard’s boot. In rain and sleet, Willard and Wilbur were marched towards Germany. While bedded down in a boxcar, they narrowly avoided bombing by an Allied plane, which destroyed part of the train track, the train’s engine, and coal car directly next to the POWs. The next morning, after the prisoners were forced to rebuild the train tracks, they were transported to Bad Orb, Germany and marched to Stalag IX-B, considered one of the worst German POW camps. The prisoners passed the time by singing, writing poetry, praying, and sleeping. They regularly went without food and, when fed, were forced to share a loaf of bread with six or seven other men. Many prisoners, including Wilbur, became too sick to move. On January 25, 1945, Willard was sent to Stalag 9A. It was the last time he would ever see his twin brother. Willard was liberated on March 20, 1945. Wilbur’s fate was unknown until a fellow soldier saw Willard and said “I swear to God I buried you at Mannheim.” It was then that Willard realized his brother had not survived. Wilbur died in a POW hospital on February 21, 1945 at the age of 22. Years later, Wililard learned that his brother had died of pnemonia, despite the efforts of German doctors to save him. After the war, Willard went to vocational school in Sheboygan and became a machinist. He married and had four children. Willard passed away on May 14, 2008 at the age of 85. He donated artifacts from his service and recorded an oral history with the Wisconsin Veterans Museum, preserving both his and Wilbur’s stories for future generations. This article appeared in the Winter 2014 issue of The Bugle, the Wisconsin Veterans Museum’s quarterly publication and an exclusive benefit of WVM membership. Learn more about The Bugle at here. Read Willard Diefenthaler’s oral history at here.